Better Soil – Soil in raised garden beds is typically fresher, easier to amend, and less compacted. As a result, your fruits and vegetables will flourish from a better growing environment. One where roots can penetrate deep into the soil. Better soil is particularly advantageous for produce that grows below the ground, such as carrots, potatoes, and onions. Better Drainage – Drainage is typically improved with raised garden beds because the soils are easier to amend and soil is less clay-like. Proper drainage is important for vegetables, particularly tomatoes, so that the produce does not experience rot from consistently wet conditions. pH Neutral Soil – Many vegetable plants can tolerate some acid in the soil, but too much can stunt growth and harm the plants. Because of acid rain and repeated fertilizer applications in our typical lawns, if you were to reuse that dirt in a vegetable garden, you will likely be reusing acidic soil. Start with better soil and maintain it with applications of limestone and you will be all set! Less Weeds – Because of the physical barrier that a raised garden bed creates, weeds will be less prone to spreading and sprouting in your garden. 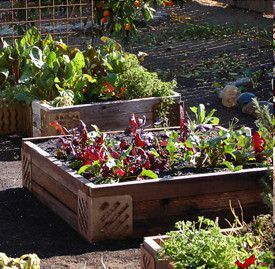 Warmer Soil Early in the Growing Season – Above ground raised garden beds will warm up faster each spring and provide optimal ground temperatures for your fruits and vegetables earlier than planting directly in the ground. As a result, you can plant earlier and start seeing the fruits of your labor sooner! Raised garden beds are gaining popularity and come in all sorts of shapes and sizes. You can make your own from lumber and elbow brackets or you can consider some of our simple do-it yourself situations, such as the M-Brace customizable garden bed brackets or Gronomics modular 48″ x 48″ cedar garden kit (which sells for $99.99 in-store). Experience all of the benefits of raised garden beds but keep them out of the reach from deer, rabbits, and groundhogs easier with container gardening. The EarthBox is a great way to grow vegetables anywhere, which makes them particularly beneficial for those with apartments/condos or for those who would like a garden on their deck or patio!